In the Beginning There Was…What? What came first, you or the universe? The answer is not only unsettling, but suggestive of something both mysterious and inescapable: that you’re the template for the universe and the laws of nature themselves. There’s more to life than can be explained by our science. One night, several strange glowing objects caught my attention on the side of the road. I thought they were some of those jack-o’-lantern mushrooms Clitocybe illudens. I squatted down to observe one of them with my flashlight. It turned out to be a glowworm, the luminous larvae of the beetle Lampyris noctiluca. There was a primitiveness in its little segmented body, like a trilobite that had just crawled out of the Cambrian sea 500 million years ago. There we were, the beetle and I, two living objects that had entered into each others’ world. It ceased emitting its greenish light, and I, for my part, turned off my flashlight. I wondered if our little interaction was any different from that of any other two objects in the universe. It’s true chemistry and physics can tackle the foundations of animal systems, but a full understanding of life can’t be found only by looking at atoms and molecules. Conversely, physical existence can’t be divorced from the life that coordinates sense perception and experience. This creature and I were connected not only by intertwined consciousness, but by a pattern that’s a template for the cosmos itself. Just as a postage stamp of Elvis would reveal to an alien visitor much more than a frozen snapshot of pop music history, the slug had a tale to tell that could illuminate even the depths of a wormhole. The beetle had little walking legs, and possessed sensory cells that transmitted messages to its brain. Perhaps my existence in its universe was limited to a shadow stabilizing a light in the air. I don’t know. But as I left, I no doubt dispersed into the haze of probability surrounding the glowworm’s little world. We fail to recognize those special properties of life that make it fundamental to material reality. 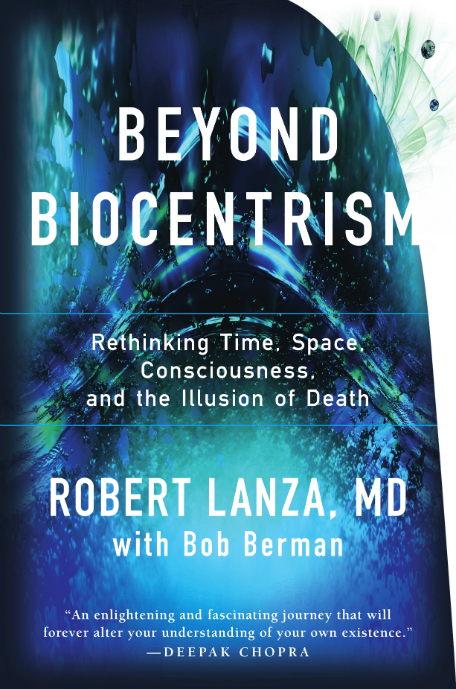 This view of the world in which life and consciousness are bottom-line in understanding the larger universe—biocentrism—revolves around the way a subjective experience relates to a physical process. A deep problem lurks, too: We’ve failed to protect science against speculative theories that masquerade as fact. 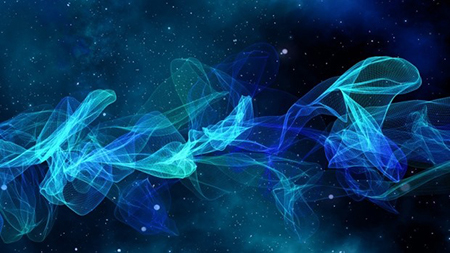 “String theory” with new dimensions blowing up in different realms, and “bubbles” shimmering down the byways of the universe are examples of this speculation. Indeed, unseen dimensions (up to a 100 in some theories) are now envisioned everywhere, some curled up like soda-straws at every point in space. Modern physics has become like Swift’s Kingdom of Laputa, flying precariously above the Earth. When science tries to resolve its conflicts by adding dimensions to the Universe like houses on a Monopoly board, we need to examine our dogmas. But the cracks in the system let the light shine more directly on the mystery of life. The root of this waywardness is always the same—the attempt of physicists to overstep the legitimate boundaries of science. The questions they most lust to solve are actually bound up with the issues of life and consciousness. If the primary questions of the universe have traditionally been tackled by physicists attempting to create grand unified theories—glamorous as they are—such theories remain an evasion, if not a reversal of the central mystery of knowledge: that the laws of the world somehow produced the observer in the first place! Our entire education system, even the construction of our language, revolves around a bottom-line mindset that assumes a separate universe “out there.” So the first step is to question the standard view that the universe would exist even if it were empty of life, and absent any consciousness or perception of it. Although there’s strong evidence from disparate sources, we can begin with simple logic. Certainly, great earlier thinkers have insisted that logic alone is all that’s needed to see the universe in a fresh light, not complex equations or $50 billion particle colliders. Absent the act of seeing, thinking, and awareness, what have we got? Take the seemingly undeniable logic that your kitchen is always there whether or not you’re in it. At night you click off the light and leave. Of course it’s there, unseen, all through the night. Right? But consider: The refrigerator and everything else are composed of a shimmering swarm of matter/energy. 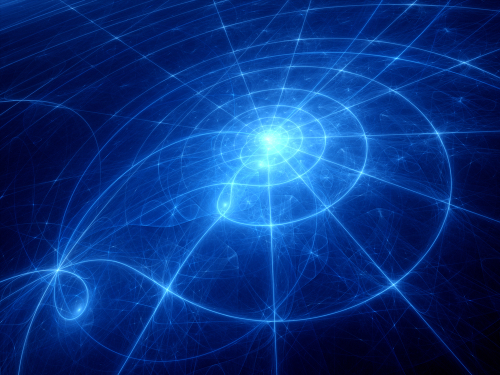 Quantum theory tells us that not a single particle actually exists in a definite place. Rather, they merely exist as a range of probabilities that are unmanifest. In the presence of an observer—that is, when you go back in to get a drink of water—each one’s wave function collapses and it assumes an actual position, a physical reality. Until then, it’s merely a swarm of possibilities. If that seems too far out, then forget quantum madness and stay with everyday science. As I discussed in a previous blog, the colors and forms known as your kitchen are seen as they are solely because light interacts with your brain. Its basic 7th grade science. Light doesn’t HAVE any color or visual characteristics at all. So while you may think that the kitchen as you remember it was “there” in your absence, the reality is that nothing remotely resembling it is present when a consciousness isn’t interacting. Most people imagine the world to exist on its own with an appearance that more-or-less resembles what we ourselves see. Not so, says biocentrism. This “Is it really there?” issue is ancient, and of course predates biocentrism. But biocentrism explains why one view and not the other must be correct. The converse is equally true: Once one fully understands that there’s no independent external universe outside of biological existence, the rest more-or-less falls into place. The structure of the universe isn’t a mere accident. The laws, constants, and forces of the universe—which could have any values whatsoever—are all exactly what they must be for you to exist. Adapted from Biocentrism, by Robert Lanza with Bob Berman.